Fiberglass Tripod Ladders Allow Use In Tight, Confined Areas While Ensuring Optimum Stability. Tripod ladders are used for irregular surfaces and reduced areas. Back rail fits easily into tight angles and other confined spaces. Type 1A 300 lb. load capacity for extra heavy duty industrial applications. Steps measure 3 D and feature double rivet assembly for increased strength. Heavy duty gusset bracing are made with heavy duty steel and provide added support. Features steel reinforced outriggers, center-pull spreader brace and outrigger rail brackets. Full Metal Boot™ wrap-around shoe assembly grips floors for maximum stability. Feet include slip-resistant rubber feet. Meets OSHA requirements. Exceeds ANSI standards. Werner CSA Grade 1A Fiberglass Tripod Ladders Feature Single Rear Rail For Use Within Confined Spaces. Werner CSA Grade 1A Fiberglass Tripod Ladders are made with a single rear rail for easy fitting into small spaces. Spreader handle design improves setup and allows easy transport. Front section is fully braced and the molded external rail shields protect against abrasion and rail damage. 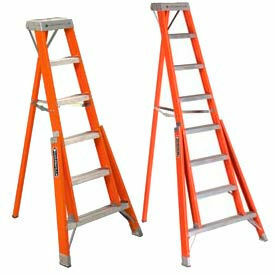 Werner CSA Grade 1A Fiberglass Tripod Ladders feature double-riveted slip-resistant TRACTION-TRED® steps. Backup plates reinforce all top connectors. Fiberglass rails are non-conductive for safe work near electricity. Werner CSA Grade 1A Fiberglass Tripod Ladders feature a duty rating of 300 lbs. 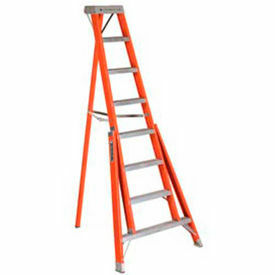 Werner CSA Grade 1A Fiberglass Tripod Ladders are available in heights ranging from 8' up to 16'.